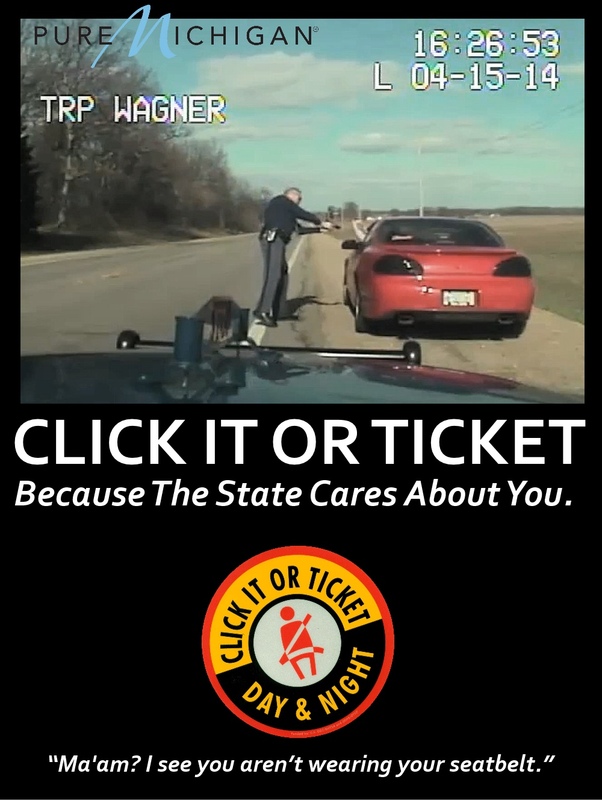 Hungry Howie’s Pizza and Michigan Office of Highway Safety Planning (OHSP) partnership is part of the annual Click It or Ticket campaign. Starting today through June 5, police departments, sheriff’s offices and the Michigan State Police will conduct stepped up seat belt enforcement. 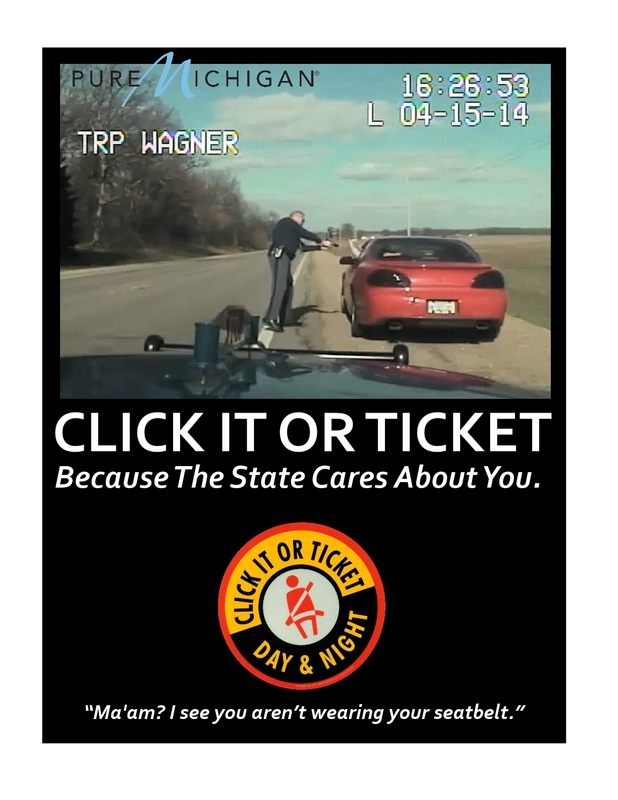 For the next two weeks patrons at Michigan’s 185 Hungry Howie’s Pizza stores who take the seat belt pledge will receive a coupon code for a Howie’s Bread® with their next online pizza order. The pledge acknowledges that while pizza makes life better, seat belts save lives. Research shows proper seat belt use reduces the risk of being killed in a crash by nearly 45 percent. ‘Research’ might also say that eating pizza at Hungry Howies or any other bread stretching joint is risky for the gluten intolerant. However, research does not always necessitate force. And “force” in this meaning is not the law of physics subject matter either. Yes, a sudden stop at the base of a tree will direct motive force to those things not tied down (you). Things in motion tend to stay in motion, etc..
Is a government gun to your head considered a favorable alternative however? Does the concern for your health offer a moral balance to the ultimate use of force that is the definition of government? Folks, I truly hope you enjoy the weekend. Make a plan to visit the local veterans memorial and pay your respect to those who fought and died so that we might have the limited freedoms we enjoy today. Wear the seatbelt and get your extra slice of bread and make it back to work on Tuesday. But appreciate the irony that abounds with seat belt traps, and the statist manipulation of your lives. Again , this is nothing new. I need to deal with this B.S. on a daily yearly basis as well. If Johnny Q. LawEnforcement is really so concerned about our well-being, I can think of more than a few examples of which they can more effectively dedicate their time. Unless they want to argue that not wearing ones seatbelt is more of a threat to public safety than getting shot? They might also want to consider keeping a closer eye on their own. I'll be more than happy to debate anyone who feels that Johnny Q. LawEnforcement pleasuring himself on images of little Sally, Timmy and Sue in various stages of undress is in any way less of a threat to the public than me driving unbelted of any other "distracted driving" excuse they can concoct. Their priorities are really messed up! Their priorities? Dude, just remember - it is all consented to.